A few years ago, when I taught the in-depth reporting class for Fresno State’s journalism department, I used to tell young reporters that if they really wanted to understand the news, they’d better start attending planning commission meetings. They would all predictably laugh, but then I’d show them some sample agendas from the campus, city, and county planning commissions to convince them how serious I was being. After reviewing those agendas, I asked students to then use published news reports and public document searches to track how some of those agenda items unfolded. Analyzing the outcomes showed students the influence that the planning commission has on public policy and everyday life. I’ve never much liked going to government meetings, myself. (As some might say: Those who can’t do, teach!) But last summer as an intern at KQED Public Radio, I was asked to work on a complex public policy story with my colleague Sasha Khokha. We took a look at “smart growth”– a city planning strategy that calls for densely built areas of homes near public transit, with lots of walking and biking space– and how the car-loving, largely suburban Central Valley was responding to its many challenges. The story was part of KQED’s excellent Miles To Go series about sustainable growth statewide, put together by the station’s Climate Watch science and public policy reporting team. The story took us nearly two months to research and put together. Sasha handled most of the interviewing, and she wrote and voiced the radio piece. I handled most of the research– which included reviewing government documents and reports related to smart growth– and I produced a blog post that included a photo gallery with captions, an interactive map, links, and an unplanned but lively discussion with KQED listeners in the comments section. 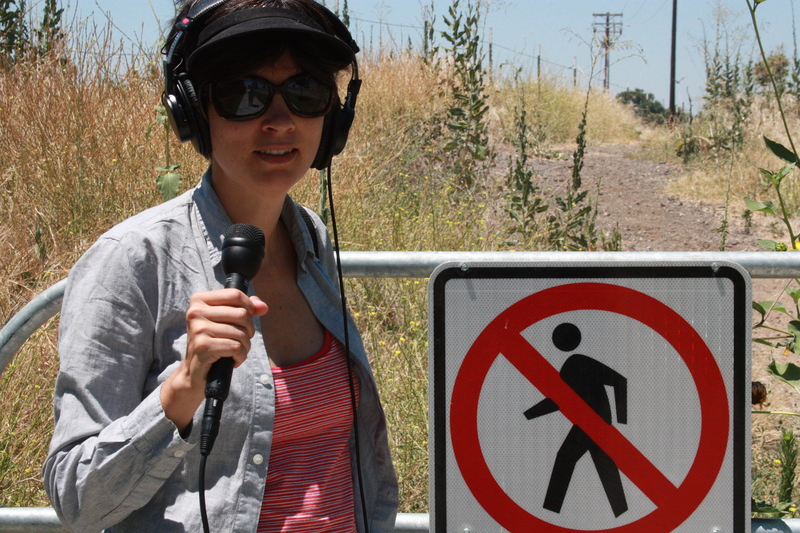 I also earned credit as a field producer on Sasha’s radio piece, as I oversaw the details of Sasha’s 4.8-mile walk from the Harlan Ranch smart growth development to the nearest supermarket. That’s Sasha with her radio gear in the photograph above, standing where the sidewalk ends. Last week, about one year to the day from when we started working on the story, I drove out to Harlan Ranch in northeast Clovis to see how far the development had come since Sasha and I visited last summer. I was shocked to see an explosion of new homes– hundreds more new homes finished than before, many of them already occupied or sold, the development creeping steadily eastward to where Freeway 168 stops being a freeway between Tollhouse Road and Shepherd Avenue and then heads for the hills. There was still no sight of the planned shopping center inside the development, but I knew that part of the plan could take a decade or more to come to fruition. People who live there still have to drive out to get to a bus stop, a gas station, or a pharmacy. There was lots of change, but also not much change. When I thought more about it, I wasn’t all that surprised. Planners had given the green light to build there, and that’s what the developers were doing. After that, people were still lining up to move in. I learned a new lesson about the planning commission: Sometimes the story isn’t over for many, many years.